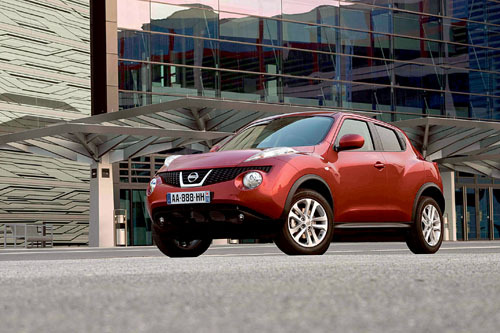 Nissan has launched its latest new model - the exciting new Juke entry-level petrol model with a price tag of €18,195. Test driving west out of Dublin, I was amazed by two things in particular. The number of other drivers and pedestrians that took a second look really surprised me. And secondly, I thought the driving position and handling of the Juke were super. The Juke has been referred to as the baby brother to the wonderfully successful Qashqai (and Qashqai+2 ) and the larger Murano, the world's first crossover. And Nissan is intent on shaking up the so-called establishment in the B segment, as the Qashqai did in the small family class. At the very least the Juke will ensure that complacency among designers will vanish from this segment. Nissan has already received more than 25,000 pre-orders across Europe since the books opened in June. At that rate, the Juke could be on the way to following in the footsteps of its bigger brother. Aimed at a younger market that Nissan says is bored with lookalike hatchbacks, the Juke combines attitude, irreverence, modish style and energy with a mischievous sense of fun. Indeed it combines many of the best attributes of an SUV and those of a sports car to give us what is probably the first ever junior crossover. And it does offer a refreshing and dynamic alternative to the traditional small hatchback. The styling has an energetic, muscular, and sporty feel. From a design standpoint, the lower portion of Juke is pure SUV. It combines chunky wheels, wide tyres, extended ground clearance and a robust stance with a top portion that is unadulterated sports car, with a high waistline, slim visor-like side glass graphics and a coupe-style falling roof-line. The coupe effect is further underlined by the rear doors which have their handles hidden in the frame of the door. The sports car theme continues inside with a cockpit-oriented cabin dominated by a centre console design inspired by a motorcycle fuel tank. Finished in a distinctive high gloss colour - metallic red or grey, the ‘bike' console adds a sense of fun to the car. Practicality is assured by the rear-opening hatch and versatile luggage area with hidden storage opportunities. The entry level petrol version Juke XE at €18,195 comes with a standard specification that includes 16" alloys, six airbags, front and rear power windows, ESP and manual air conditioning. The next step-up is the Juke SV for €1,300 more, and a further €500 will get you the sport version. Diesel models cost €2,000 more than the equivalent petrol powered XE. SV or sport. Three different engines are available - one diesel and two 1.6-litre petrol units, all fully Euro 5 compliant. At the top of the range is a new turbocharged petrol engine with direct injection (DIG-T ). The engine is one of the most powerful in its class, developing 190bhp (159 CO2 and with Band D road tax ) and 240Nm with low fuel consumption. The combination of direct injection with a turbocharger provides the power and responses expected from a 2.5-litre engine with the economy of a smaller engine. However, the vast majority of sales will come from the two smaller engines. The second petrol engine is a newly developed version from Nissan's trusted plant. The lightweight, low-friction 16-valve unit now has a unique dual-injection system allowing finer metering of the fuel sprays for better combustion and develops 86kW (117 bhp ). The 138 CO2 positions it in Band B. The 110bhp, 1.5-litre dCi emits 134 CO2 is also in the B tax band and common-rail diesel offers excellent drivability - thanks to its heady 240Nm of torque. If you're young or young at heart and are thinking of buying a new supermini or even down-sizing from a segment above, you should really grab a chance to have a test drive in the new Nissan Juke. Page generated in 0.0929 seconds.